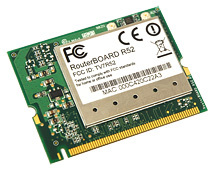 Mikrotik RouterBoard R52 wireless 802.11a+b+g miniPCI card for multiband high speed applications! It can work either on 2.312 - 2.497 or 4.920 - 6.100GHz range. 802.11a/b/g MiniPCI card - 79mw output Atheros - AR5414 chipset - Dual U.fl antenna connectors.